Posted on Friday, March 1st, 2019 at 6:54 pm. About the Author: Lynette Evans-Tiernan serves as a Public Affairs Officer for the Exchange Visitor Program at the U.S. Department of State. Assistant Secretary for Educational and Cultural Affairs Marie Royce and Ambassador Domingos Fezas Vital of the Embassy of Portugal sign MOU. 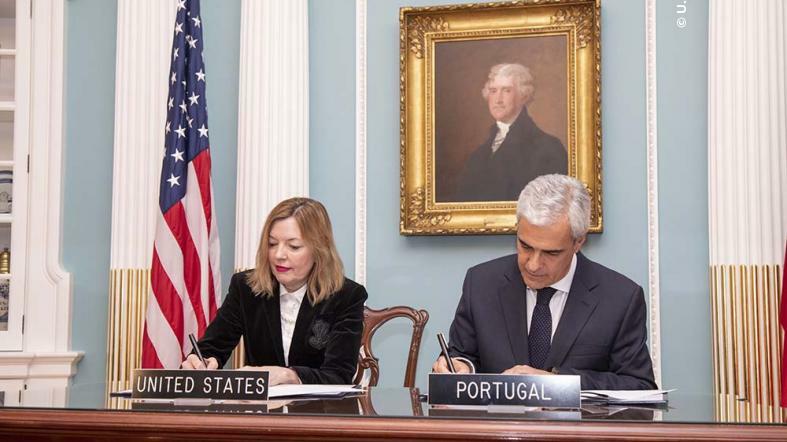 On February 11, Assistant Secretary of State for Educational and Cultural Affairs Marie Royce and Ambassador Domingos Fezas Vital of the Embassy of Portugal convened in the State Department’s Treaty Room to sign a Memorandum of Understanding. The MOU will increase intercultural learning and provide structured and guided training for American and Portuguese emerging leaders interested in learning about innovation and organizational growth and development. The MOU provides for the establishment of 400 training, study, and work opportunities in each country for students and budding entrepreneurs in the areas of innovation, early-stage organizations, and advanced manufacturing. Portuguese participants will learn about organizational development in the United States by working in an American host organization while the reciprocal program will allow U.S. citizens the opportunity to study and work abroad. This agreement builds on diplomatic ties by supporting the U.S. foreign policy goal of promoting entrepreneurship. At the ceremony, Assistant Secretary Royce applauded the U.S.-Portugal Standing Bilateral Commission and the U.S. Embassy in Portugal for being strong champions of people-to-people ties. “I look forward to working with Portugal in the development of our economies and infrastructures that will increase our global competitiveness,” said Assistant Secretary Royce. The 12-month pilot program will be implemented through the U.S. Department of State’s Exchange Visitor Program under the intern and trainee categories. At the ceremony, Ambassador Domingos Fezas Vital commented that the United States and Portugal were becoming in life what they have always been in geography: neighbors across the ocean. “Providing Portuguese and American youth a framework to live, study and gain work experience in each other’s country is the perfect embodiment of the diversity and dynamism of the U.S.-Portugal present relationship,” he said. This agreement will deepen and strengthen the already significant people-to-people ties between the United States and Portugal and develop the next generation of citizen ambassadors.